When a colleague forwarded a notice back in January about a podcast contest that NPR was hosting, I was immediately interested. It sounded like something my students and I would enjoy doing. The fact that I had never created a podcast before didn’t deter me. 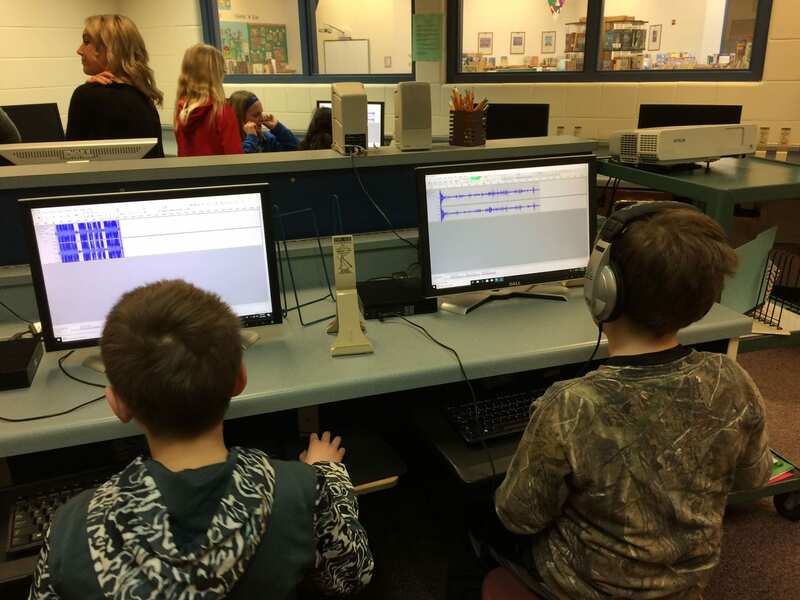 Back when I was doing my own student teaching, I had my students create radio shows. Wouldn’t this be similar? The idea of having the students prepare a script that didn’t rely on visuals was appealing. They would have to make sure they spoke in ways that complemented what they were saying. They would have to think about the words they were using and not just assume that the orthography terms they use every day would be familiar to their listener. They would have to rehearse, rehearse, rehearse so that they sounded more like they were speaking than reading. And in my mind, I knew they would need to write a script that was longer than anything they’ve written to date! What a lovely marriage of research, writing, revision, reading, speaking, and collaboration this could be! NPR supplied a well-thought-out plan for guiding educators and students through this process, so I decided to present this idea to my students. Since I teach three groups of 22 students each, I wondered how many of the students would be interested. I needn’t have wondered. It turns out they were ALL interested! Okay! We were in! We began by listening to some of the podcasts recommended by NPR. We listened to one a day for several days, pausing to discuss the kinds of information we felt was important to have been included, the overall feel of the podcast, the seriousness of the overall information sharing, even when humor was involved, and the sound effects. Each day, the excitement grew in regards to writing their own. Many were regular podcast listeners and were especially enthusiastic. The majority of students, though, had never listened to a podcast before this. But they too became enthused as they listened to the well-put-together podcasts each day. The first thing we had to do was think of our topic. For me, that was obvious. The students would be randomly placed in groups and would each investigate a word of the group’s choosing. They loved that idea! The students had investigated words on their own several times and were familiar with the resources to use. This idea gave them a level of comfort as they began. Putting them in groups of 4-5, meant there were five groups in each class. That meant we would be creating a series that included 15 podcasts. 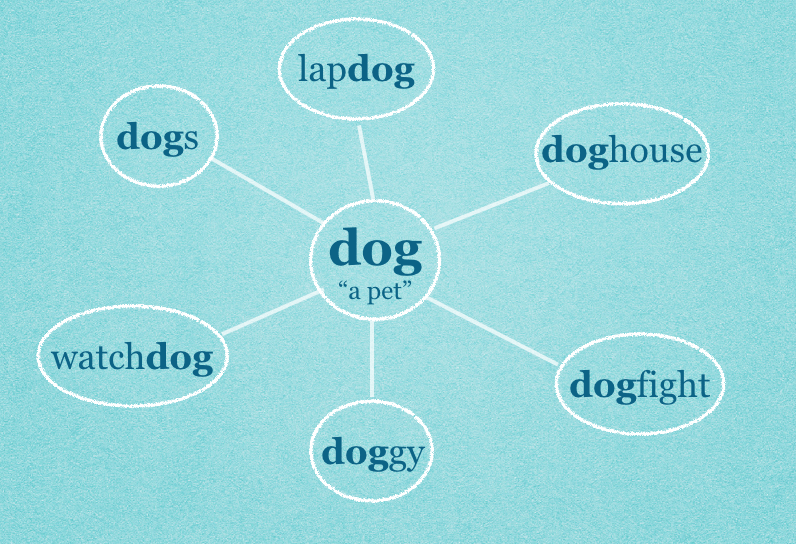 The students wouldn’t just be looking at the word’s etymology or root, they would also be looking at how the word’s use or spelling might have changed over time. 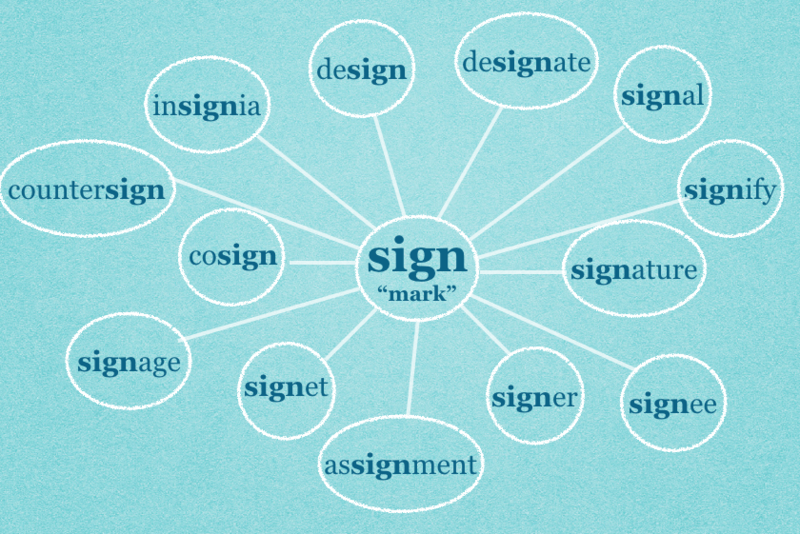 It would also be important to include current information about this word’s meaning and its use. In other words, they would be providing a broad look at a single word. This was going to require a lot of research before script writing could even begin! The students took a few days to think about what word they would choose. Some were inspired by what they had been learning about during their study of the Civil Rights Movement (segregation, peace). Others brainstormed a list and then looked up information on each to see which sounded more interesting to them. One group paged through a copy of John Ayto’s book, A Dictionary of Word Origins, and found their word (eureka). As soon as each group had decided, they let me know and then started learning as much as they could. As they found out things, they shared the information with the group. 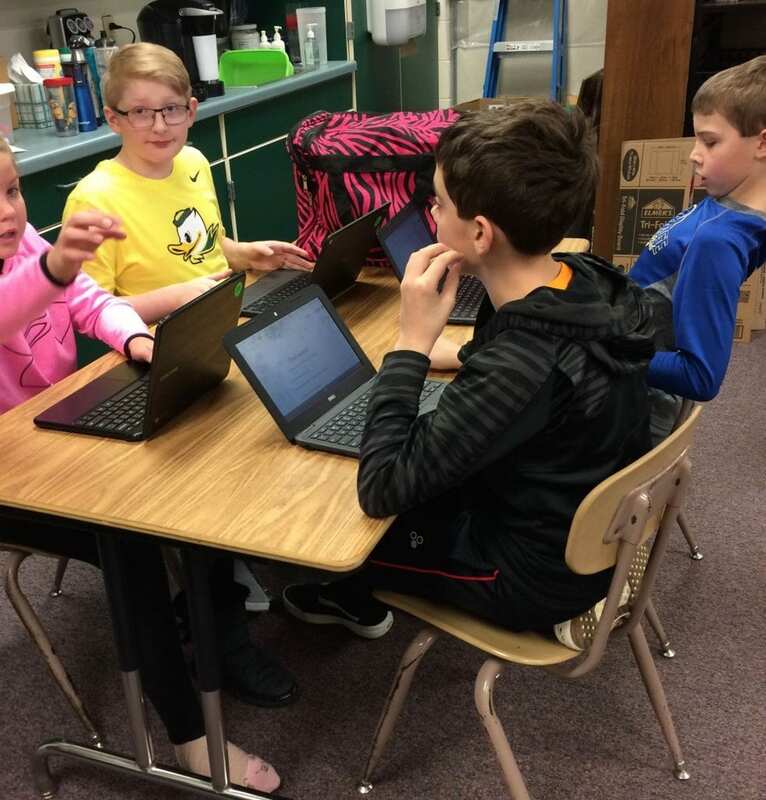 Several days in, each group started writing a script. According to the NPR guidelines, the podcasts were to be a minimum of 2 minutes long with a maximum length of 12 minutes. These scripts were no doubt the longest scripts any of these students have been a part of writing! When they would tell me they were finished, I would ask them if they timed themselves practicing their podcast. When they did, they would realize their podcast was too short. So then the real digging began. The search for related words. The search for changes in spelling over time or changes in meaning over time. The search for the word to be used in different ways depending on a context. The search for how the word is used today and perhaps which people have become associated with the word. And with this renewed digging, this need to find more, came some surprising facts which were surprisingly satisfying! I could feel the level of engagement increase among the students. They would enter my room each day with the same question ready for me, “Are we going to work on our podcasts?” After a quick progress check (making sure each person knew their role and each group was focused), they grabbed their Chromebooks, found a table or grouped desks together and got to work. Every once in a while I would hear an extended patch of laughter coming from one or another group. When I went over to check it out, it was always related to their script or the misreading of it or some information they found that seemed funny. They were still engaged, just enjoying the team work atmosphere and the shared experience of creating something worth creating! A few groups included interviews. 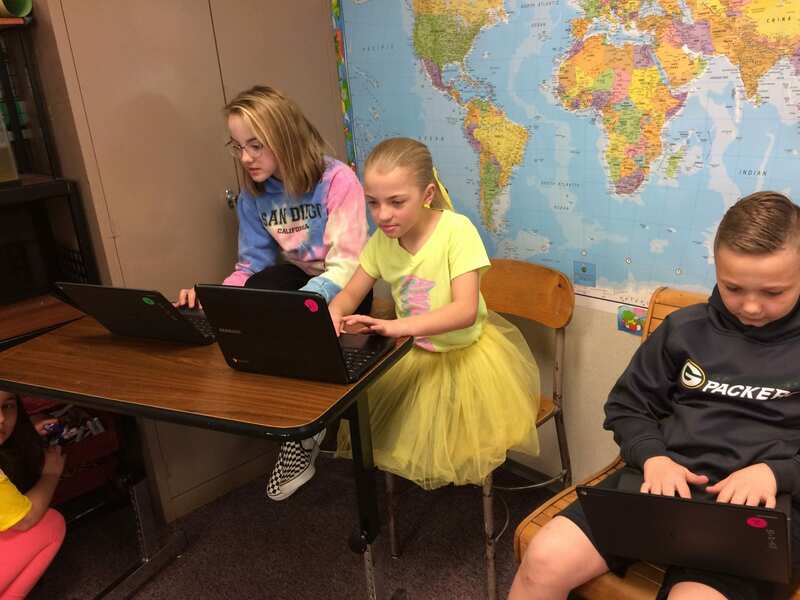 The group that was looking at “segregation” interviewed their social studies teacher. The group that was looking at “frog” interviewed me. (My fondness for all things “frog” is obvious to those who enter my room!) And the group that was looking at “lexical” interviewed the creator of The Online Etymology Dictionary, Doug Harper. That interview was something we all benefited from. It was a Zoom (online) interview and the whole class was able to meet and listen to Mr. Harper! 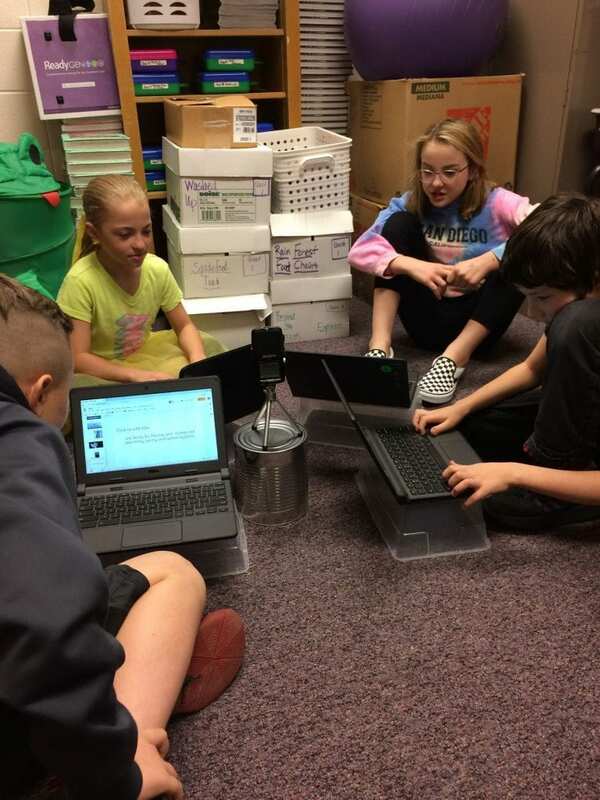 After three weeks or so (I kept reassuring them that the research and writing should be the most time consuming of any part of this project) the first of the groups finished, and said they were ready to record. It was time to start the next phase of this project. According to the guide at NPR, I could have recorded these audio files on my iphone, but with 15 groups, I could imagine running into problems with space on my phone. So I purchased a recorder. I’m so glad I did! I would get it set up for the students and they took it from there. Most all of the groups recorded more than once. That was fine. We were all getting used to the equipment, being loud enough, being slow enough, and having enough expression in our voices. We turned a small storage room into our “recording studio.” You can see my recorder on the inverted tin can in the center. 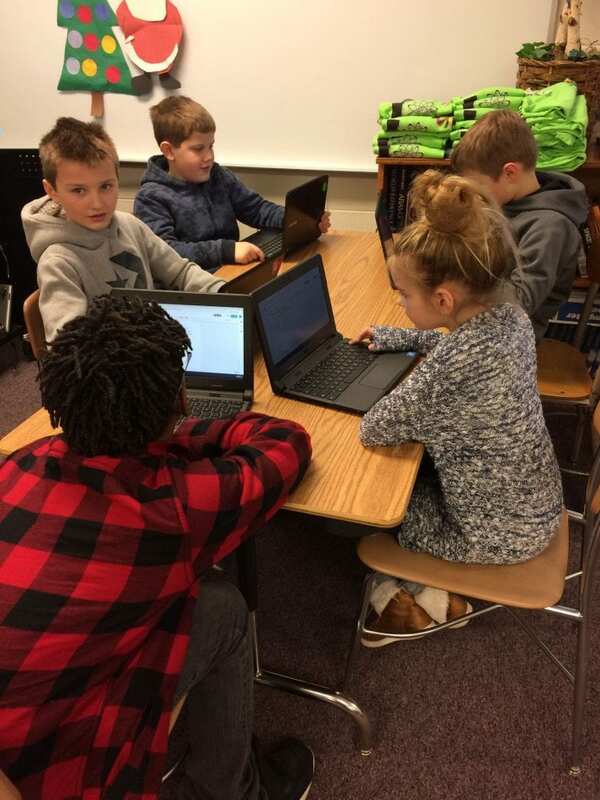 The students read their scripts from their Chromebooks so they wouldn’t have to worry about the added sound of papers shuffling. 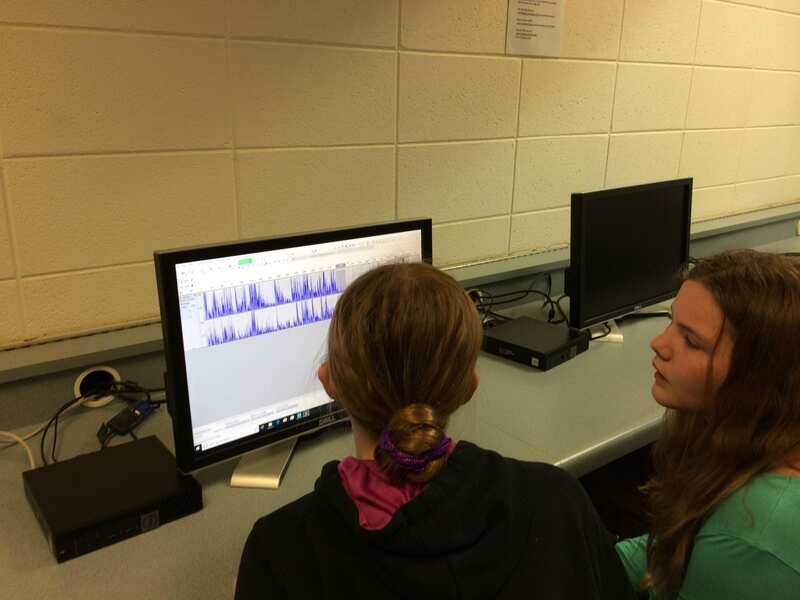 Next we went down to the computer lab and uploaded the audio file into Audacity which is a free software for editing audio files. 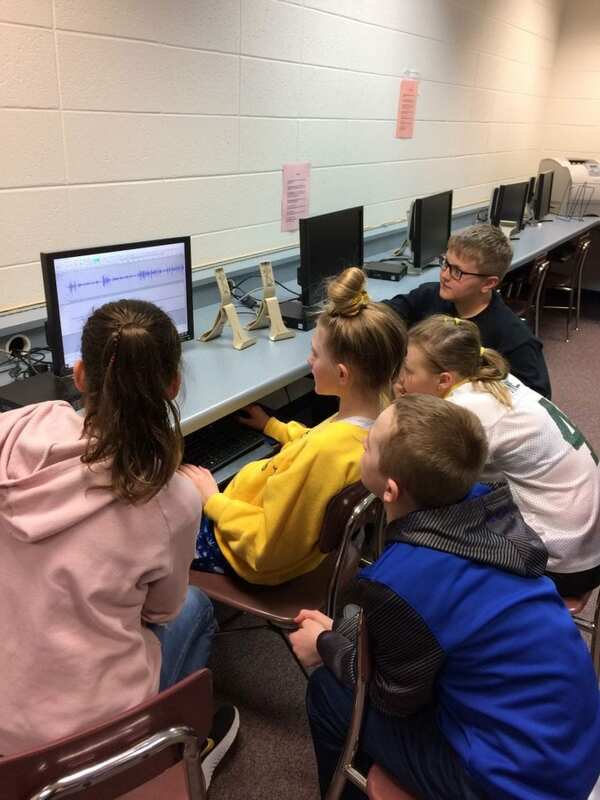 The students had never used Audacity before, and neither had I. So the students learned to use the HELP tab. When they couldn’t find their answer there, they tried looking for a video at Youtube that would walk them through editing at Audacity. Sure enough! They not only found answers, but could watch someone do what they needed to do. They became pretty confident at editing and offered help to other groups who became stuck. So not only was I seeing cooperation within the groups, I was seeing cooperation between the groups! 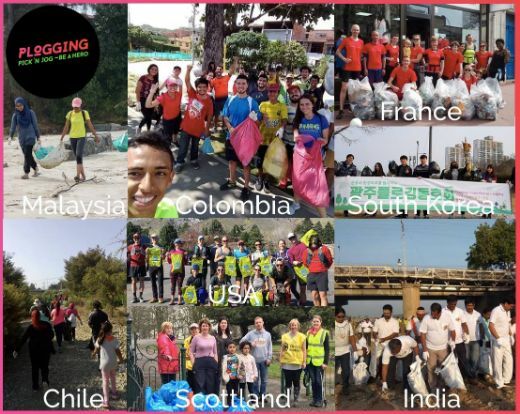 This experience just kept getting better and better! The trickiest part of this editing was that at some point we had five groups in the lab all trying to listen and edit their podcast. If headphones were used, that meant that only one person would be making decisions, so the groups usually used headphones only for listening to the instructional videos at Youtube. But one by one, the groups finished the editing and I saved the file to a flash drive. Then it was back to the classroom for the group. 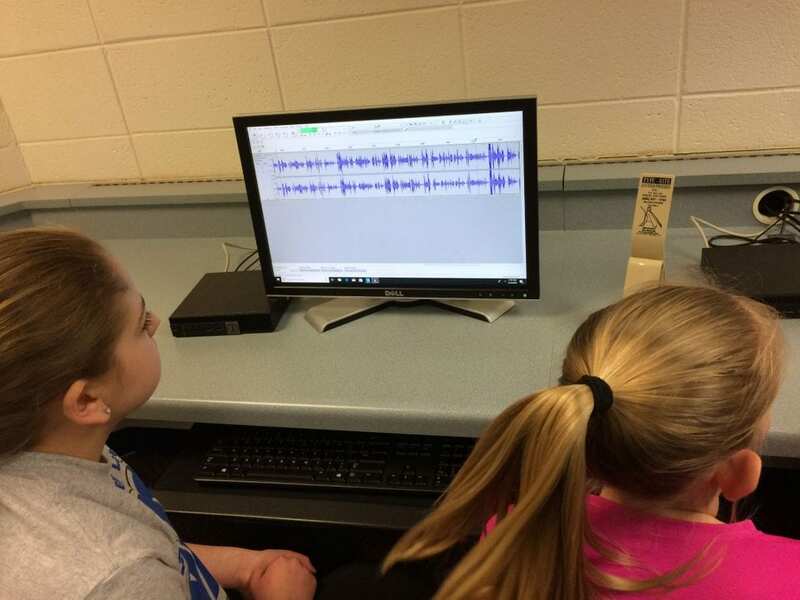 Once they finished their podcast, I asked them to present their same script as a video. They now had the opportunity to add pictures, images, and matrices to enhance their information. This seemed like another way to share their word investigations in a slightly different platform! As the groups finished, I uploaded each podcast to SoundCloud. From there, NPR will be able to access them as part of their judging. Then I filled out the entry form for each group. They will be judged in the 5th-8th grade category. Will one of these podcasts win? Who knows. All I know is that in the hearts and minds of my students, they have already won. When I hear students say, “I am really proud of our group! I’m proud of me!” then I know that this learning experience has been rich and worthwhile. We all know that learning isn’t just about learning the content. And this experience was no different. These students had to persevere when the editing got confusing or they just couldn’t figure something out. They had to ask for help when needed because this project had a deadline and there wasn’t time to waste. They had to use patience when one member stumbled over speaking parts or pronunciation of words. (They were so helpful and kind to one another and never minded practicing just one more time before recording.) They had to be willing to go back and re-record if the group felt that was the best option. You see, with every group I saw a serious goal of turning in the best version of their podcast that they could. I was constantly proud of their attitude, work ethic, and respect for members in their groups. Were there moments of chaos and discord? Absolutely! 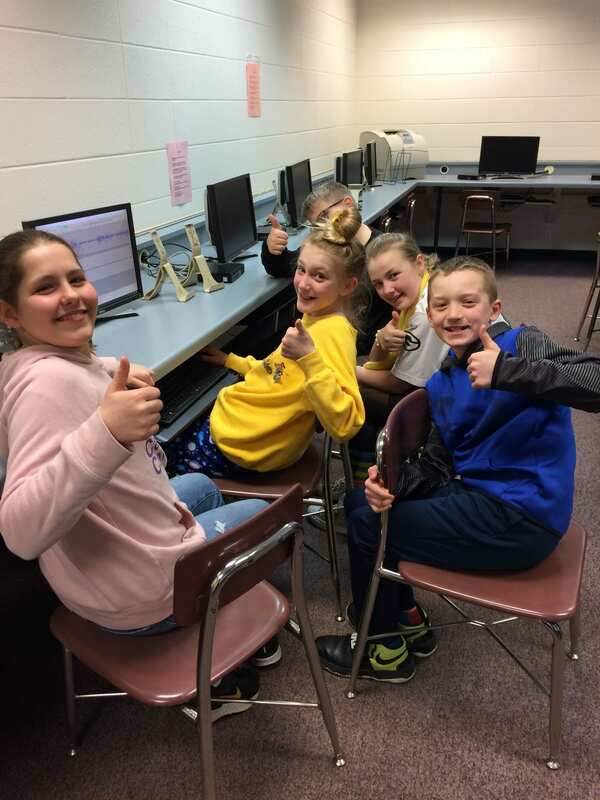 But all in all, the students learned to redirect their attention, be accountable for their contribution to the group, compromise with members in their group, and compliment each other for little things done well! In other videos my students have created, I have been the script writer. This time the students can proudly say they did every facet of this project themselves. Mind you, if I noticed that something was incorrect or mispronounced, I spoke up and the students willingly amended their podcast. But I’m sure I missed a few things as well. Just today I was listening to the episode about “Eureka!” About three fourths of the way through, I realized that the name of the city they were mispronouncing was Syracuse! Made me chuckle. Their mispronunciation made me think at first that it was a city I didn’t know! It is still one of my favorite podcasts in this series. Okay, so in truth I have around 15 favorites in this series! Making Sure Our Misspellings Are Not Missed Opportunities! Following our recent performances of The Photosynthesis Follies, I gave a test. After all, the students had been living and breathing their photosynthesis script for two and a half weeks. I was confident that if they participated and thought about what was happening in our play, they would understand this incredibly important process. They did remarkably well! But that is not the point of this post. As I always do, while I was correcting the tests, I was taking notes about sentence structures that needed attention and common spelling errors that needed to be addressed. I began to notice how many different spellings were used for the word <xylem>. 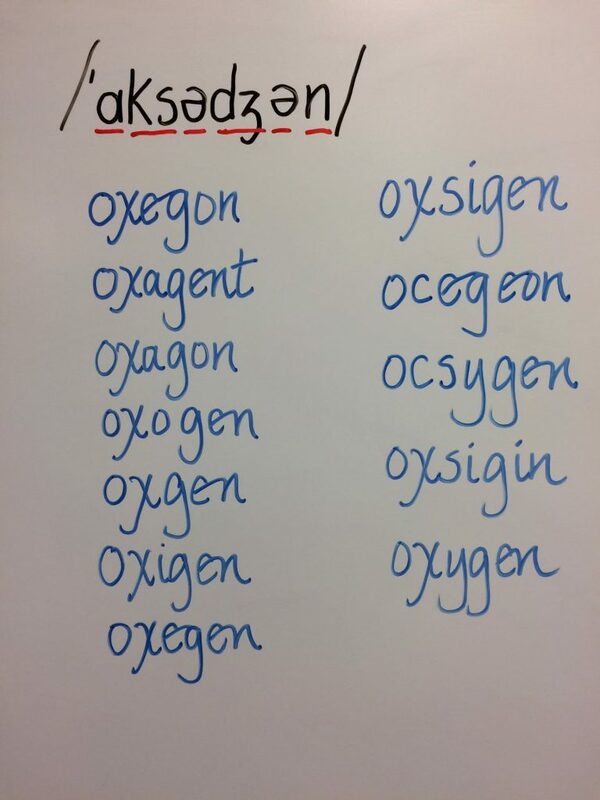 But within a short amount of time, the number of different spellings for <xylem> was surpassed by the number of different spellings for <oxygen>. As I looked over the spellings, it struck me that my students actually know quite a bit about graphemes and the phonemes they can represent. I thought it might be interesting to specifically look at these two lists. At the top of each list the word is represented by IPA and the symbols are surrounded by slash marks. The slash marks indicate that this is a pronunciation and NOT a spelling. I wanted the students to think about each word’s pronunciation and how each phoneme in the pronunciation is represented by a grapheme in the word’s spelling. To that end, I underlined each phoneme in the IPA representation of the word <xylem>. “Perhaps it’s because of the way we pronounce the letter <x> when it’s by itself.” That made a lot of sense to me. After all, during play rehearsals, we had a few students that kept pronouncing xylem as /ɛgzˈɑɪləm/. Since the word began with <x>, those students wanted to pronounce it like we do in /ˈɛksɹeɪ/ (x ray). We looked at the various pronunciations that are represented by the letter <x>. We pronounced them aloud and felt the difference between the /ks/ of box, the /gz/ of exact, and the /kʃ/ of anxious. Taking the time to pronounce and feel these pronunciations in our mouths was an eye opener for my students. When all you remember being told is that “x is for x ray”, you’re at a disadvantage when trying to read and spell words with an <x>! 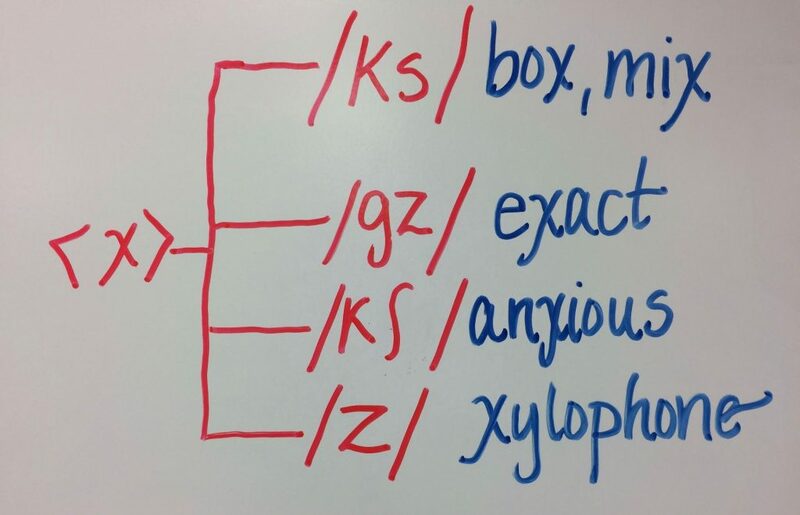 When we looked at the fourth phoneme that could be represented by the grapheme <x>, /z/, we recognized that not only was that the way we pronounced <x> in xylophone, but also in xylem! We turned our attention back to the list. We looked specifically at the unstressed vowel known as the schwa in IPA. I reminded the students that some of them had this schwa as part of the pronunciation of their name. They offered that the schwa, /ə/, is sometimes represented by the grapheme <i> as in Jaydin, by the grapheme <a> as in Amelia, by the grapheme <e> as in Kayden, and the <o> as in Jackson. So with that in mind, we looked at the choices students had made in choosing a vowel to precede the final <m>. Students chose either an <a>, an <e>, or a <u>. This was in keeping with what we understand about the schwa. I also reminded everyone that the schwa represents an unstressed vowel. That meant that the other vowel in this word, represented by /ɑɪ/, would be carrying the stress. 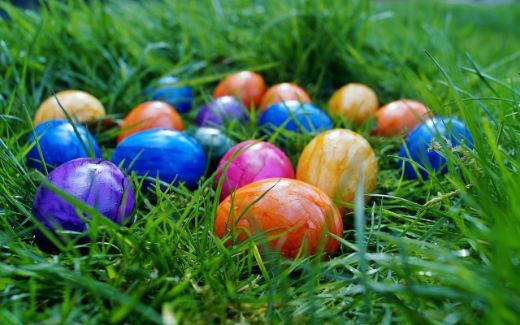 And sure enough, when we announced the word over and over, the stress was on the /ɑɪ/. Looking back at the list, there were only two graphemes chosen to represent the /ɑɪ/. It was either an <i> or a <y>. I wondered aloud if it was possible for a <y> to represent /ɑɪ/. Students named words like sky, xylophone, and cry to provide the evidence that it could. 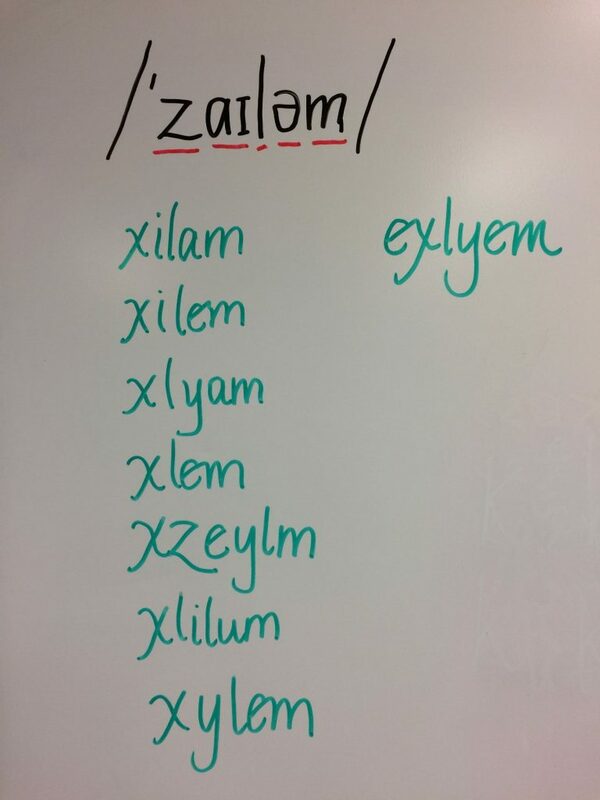 So when we now looked at our list, we realized that only three of the spellings made sense and were possible — the first (*xilam), the second (*xilem), and the last (xylem). The third, fourth, and sixth were missing the grapheme that paired up with the phoneme /ɑɪ/. So now what? Now it was time to check into this word’s etymology. Looking at Etymonline, we see that it was first attested in 1875, meaning “woody tissue in higher plants”. It was from German xylem, coined from Greek ξύλον, transcribed as xylon “wood”. This was particularly interesting to us because we were focusing on the water that is transported in the xylem. Now we knew that the xylem itself was made of woody tissue and helped physically support the plant or tree! According to the Encyclopedia Britannica, only the outer xylem (sapwood) is active in transporting water from the roots to the leaves. The inner part of the tree (heartwood) is made up of dead xylem that no longer carries water, yet is strong and gives the tree that physical support. The next time you count the rings on a cross cut piece of a tree, know that you are counting rings of xylem! Here’s an easy way to see the xylem tubes in a piece of celery. And just in case you are interested, the word xylophone was also coined from xylon “wood”. 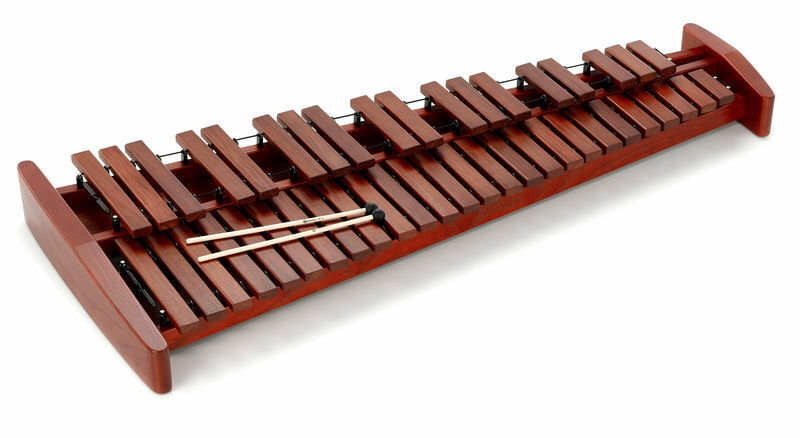 The xylophone consists of wooden bars struck by mallets. Getting back to the spelling of xylem, we also noticed that the vowel following the <x> has been a <y> all the way back to Greek! As a matter of fact, seeing a <y> medially in a word is an indicator that the word is from Greek! The only grapheme yet to check was whether the unstressed vowel preceding the final <m> was an <e> or an <a>. At Dictionary.com I found out that xylem was from <xyl> “wood” + <ēma >. The entry also said to “see phloem”. Interesting! So the second part of this word is the same as the second part of the word phloem. Still at Dictionary.com, I found out that the second part of the word phloem is <-ēma >, a deverbal noun ending. 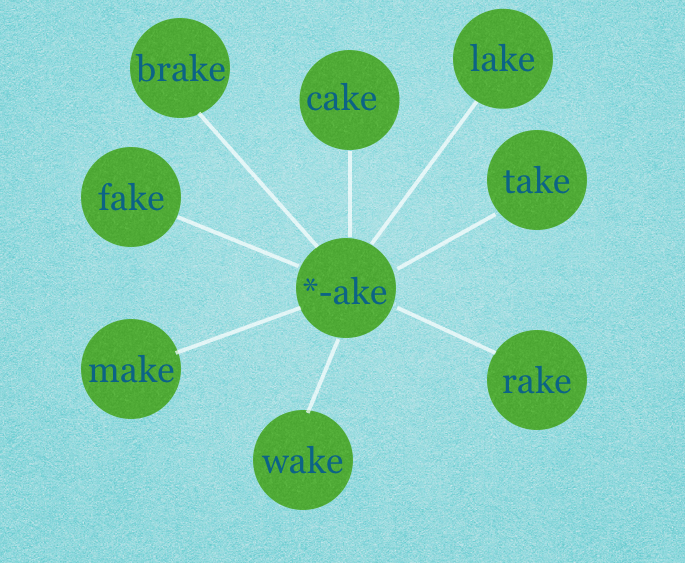 A deverbal noun is a noun that was derived from a verb. Etymonline also listed <-ema> as the suffix in the word phloem. So we now have evidence to support that <xylem> is the way to spell this word. We also have an understanding of so much more! It was time to look at the IPA for <oxygen> and see what we could learn. I again underlined the phonemes in the IPA that would represent a grapheme in the spelling of the word. 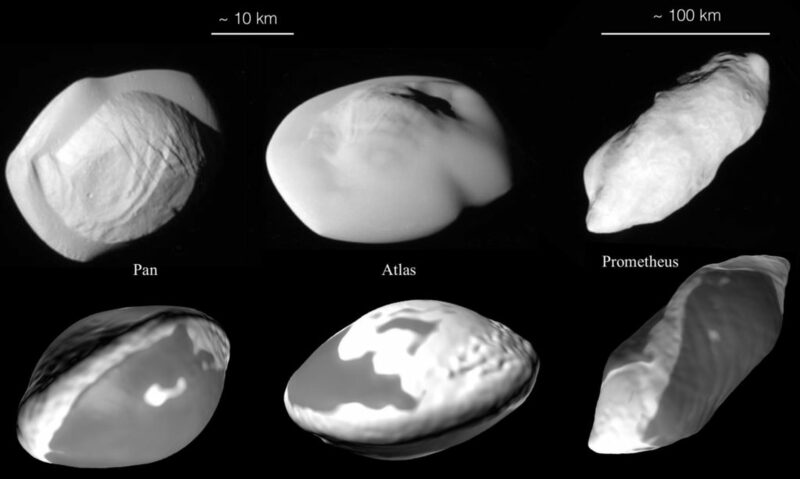 We noticed that everyone chose <o> to represent /ɑ/. The next phoneme was /ks/. There were only two spellings that had something other than an <x> to represent this. I asked if choosing a <c> or a <cs> made sense. The students recognized that a <c> can sometimes be pronounced /k/, so we could understand someone choosing <cs>. The <c> by itself, however, could not represent the phoneme /ks/. We could rule that spelling (*ocegeon) out. We also noticed that two of the spellings had <xs> as representing /ks/. This brought us back to our discussion of expire from the other day. We knew the <ex-> was a prefix with a sense of “out” and the base is from <spire> meaning “breathe”, but that when joined together, the <s> on the base was omitted or elided to make the word easier to pronounce. Now we could also rule out the spellings *oxsigen and *oxsigin. AUTHOR’S NOTE: A friend emailed me regarding this post and in particular, the above paragraph. We are now both curious about instances in which the prefix <ex->is followed by <s>. There are a few older words (very few) like exsanguine (bloodless) and exscind (cut off or out) where we see this letter combination. Perhaps it was more common a while back and moving forward in time, the <s> in many of the words was elided. I’m not sure. My take away is that I don’t have to have the precise answer right now. It is something I will keep in mind as I encounter other words. In the meantime, I am also contemplating words in which the <ex-> prefix is followed by a base with an initial <c> as in <exciting>. We know that the <c> (when followed by <e>, <i>, or <y>) is pronounced /s/. So why is it that very few words follow the prefix <ex-> with an element that has an initial <s> for pronunciation’s sake, yet many words follow an <ex-> prefix with an element that has an initial <c> that is pronounced as /s/? Interesting questions, right? Well, as a very good friend says quite often, “There are no coincidences!” That very question was asked in a scholarly group I was part of today! Just because the <c> (when followed by <e>, <i>, or <y>) is pronounced /s/ in Modern English spellings, doesn’t mean it follows that convention in other languages, or that it did in Latin. So the <ex-> prefix followed by an element with an initial <c> didn’t (and in many languages still doesn’t) present the same pronunciation situation that <ex-> followed by an element with an initial <s>. What an elegant explanation! The next phoneme in the pronunciation was a schwa – an unstressed vowel. We knew from our look at xylem that several letters could represent /ə/. There was one spelling that was missing the representation of this vowel. We could take that spelling off the list of possibilities (*oxgen). The rest of the letters used to represent /ə/ could be used, so we kept going. The next phoneme in the pronunciation was /dʒ/. The students pronounced it and noticed that every spelling left represented /dʒ/ with the grapheme <g>, even though it could also be represented with <j>. It was time to look at the second /ə/ and again recognize that this pronunciation can be represented with many vowel letters. It was interesting to note that almost all of the spellings used an <e>. Only two spellings used an <o>. I asked if anyone could think of words with a <gon> at the end. Students thought of polygon, dragon, and wagon. We wondered if following a <g> with an <o> and a <n> would always result in the <g> being pronounced as /g/ instead of /dʒ/. If that was the case, the grapheme <o> wouldn’t work in this position in this word. When looking at the final phoneme /n/, we noticed everyone chose the grapheme <n>to represent it. That is, all except for the spelling with the final <t>. Students offered theories about why someone might think there was a /t/ pronounced finally, but in the end we decided that was not the spelling we were after, and we could eliminate it as a reasonable choice. It was time to search our etymology resources! There must be information in this word’s history that will lead us to the current spelling. At Etymonline we found out that this word was attested in 1790, referring to “a gaseous chemical element”. It was from French oxygène, coined in 1777 by the French chemist Antoine-Laurent Lavoisier. It was from Greek oxys “sharp, acid” and French <-gène> “something that produces”. The French <-gène> was from Greek <-genes> “formation, creation”. The denotation of the <oxy> part of this word doesn’t seem to make sense until you know this word’s story. At the time this word was coined, it was thought that oxygen was essential in the formation of acid (hence it’s name meaning something that produces acid). We now know that isn’t the case. Isn’t that interesting? As usual, the etymology added a lot as far as understanding the spelling of this word. We found out that the <x> is the letter to represent /ks/ and the <y> will represent the /ə/. That eliminates all spellings except <oxygen>. Pretty cool, huh? When all was said and done, we noticed one more thing. In the word <xylem>, the <y> was stressed and pronounced /ɑɪ/. In the word <oxygen>, the <y> was unstressed and pronounced /ə/. There are many reasons I chose to take a closer look at these misspellings. One of the biggest was that of letting my students know that they know a lot about graphemes and the phonemes that they represent. So often a student will feel bad when they misspell a word. Well, today I wanted to celebrate the logical thinking they do when they are thinking of how to spell a word. But I also wanted to point out that without etymology, we can only go so far. After that it becomes a guessing game. I filmed this lesson with my first class. 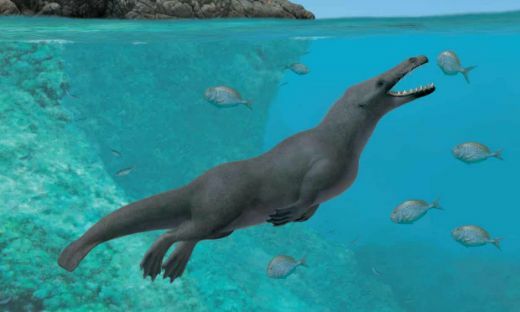 It is similar to what I have described here, although what I have written here is an overall impression from my experiences talking about this with three classes.